The forecast looks cloudy for Sam Champion's career. The celebrated meteorologist is calling it quits at The Weather Channel after just three years on the network — and it's unclear what's next for the TV personality. Champion, 55, originally joined the Atlanta-based channel in 2014 with hopes of becoming an editor after a seven-year stint on ABC's "Good Morning America," but things didn't exactly work out that way, the Atlanta Journal-Constitution reported. After he was slowly pushed out from the network's "AMHQ" morning show in Sept. 2015, he floated around on the network before getting his own nighttime show "23.5°" this March. He also allegedly tried to leave the network to return to "GMA" in 2015, but an ABC rep said its weather team was already in place. A rep for Champion did not immediately return a Daily News request for comment. Champion reportedly got more buzz during the few times he since guest hosted "GMA" than on his own show, according to AJC. In January, he returned to the show to cover his successor Ginger Zee's maternity leave. The final episode of "23.5°" will air on Tuesday at 11 p.m. The weatherman is no longer living in Atlanta, where the show is located, and has moved to Miami where his husband, Brazilian visual artist Rubem Robierb, is located. Veteran weather anchor Sam Champion will be hosting his last show for the Weather Channel on Tuesday after spending three years with the network, AJC blogger Rodney Ho wrote Monday. Champion moved to the network with much fanfare to become the main anchor of “America’s Morning Headquarters” in 2014. The former “Good Morning America” weatherman described his decision to join the network as “momentous” at the time, saying he couldn’t pass up the network’s “genius” plans. He was dropped from the program in late 2015, however, before getting his own show, “23.5 Degrees,” last March. The show was based in New York, while Champion spent less and less time at the Weather Channel’s Atlanta headquarters after moving to Miami recently, according to Ho. He is due to say farewell to the network with his final hosting of “23.5 Degrees” scheduled for Tuesday at 11 p.m.
Champion, 55, originally joined the Atlanta-based channel in 2014 with hopes of becoming an editor after a seven-year stint on ABC's "Good Morning America," a spokesperson for The Weather Channel confirmed to the Daily News. After he was slowly pushed out from the network's "AMHQ" morning show in Sept. 2015, he floated around on the network before getting his own nighttime show "23.5°" this March, the Atlanta Constitution-Journal reported. A spokesperson for the Weather Channel told the News that Champion would be leaving this week as part of a mutual agreement. "While Sam will always be part of The Weather Channel family, we have mutually agreed to not enter into a new contract. As our managing editor, host of our flagship AMHQ and his pioneering work on '23.5 Degrees,' Sam's leadership has helped transform The Weather Channel into the dynamic high-quality environment it is today," the spokesperson said. "We are grateful for his contribution and dedication. We wish him all the best in his future endeavours." The weatherman is no longer living in Atlanta where the show is located and has moved to Miami where his husband Brazilian visual artist Rubem Robierb is located. 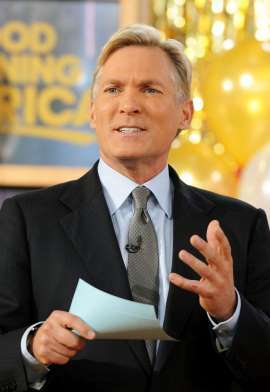 0 Response to "Sam Champion calls it quits at The Weather Channel after 3 years"